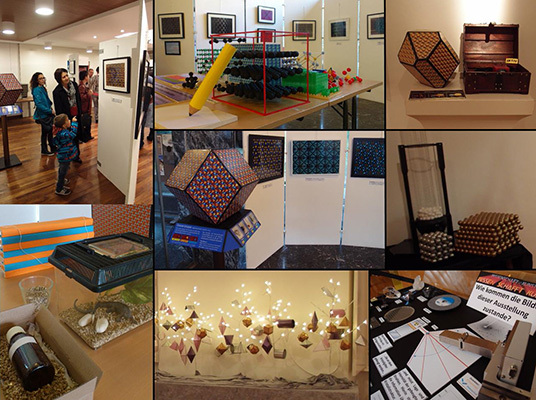 On the occasion of the „International Year of Crystallography“ (IYCr), proclaimed by United Nations (UN) for 2014, a touring exhibition through Austria was organised. Visiting all federal states, its aim was to disseminate knowledge of this science and show the relevance for our daily lives, for research and economy. 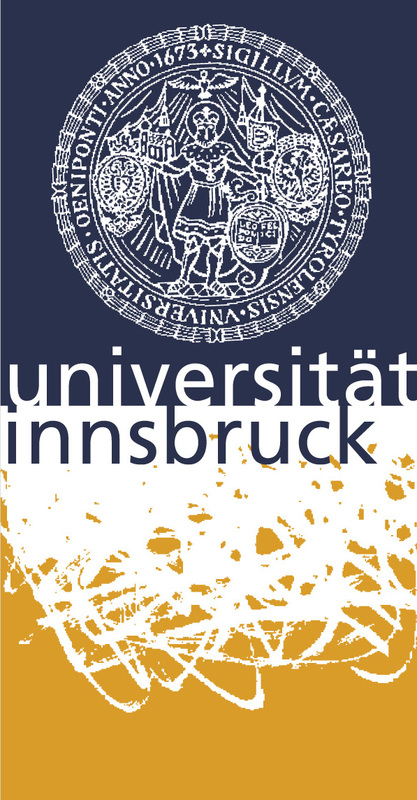 Supported by the Austrian Ministry of Science, the Austrian Mineralogical Society, the Faculty of Geo- and Atmospheric Sciences of the University of Innsbruck and PANalytical B.V. Branch Austria, organisation and execution were to the author of this report, a crystallographer and science communicator. 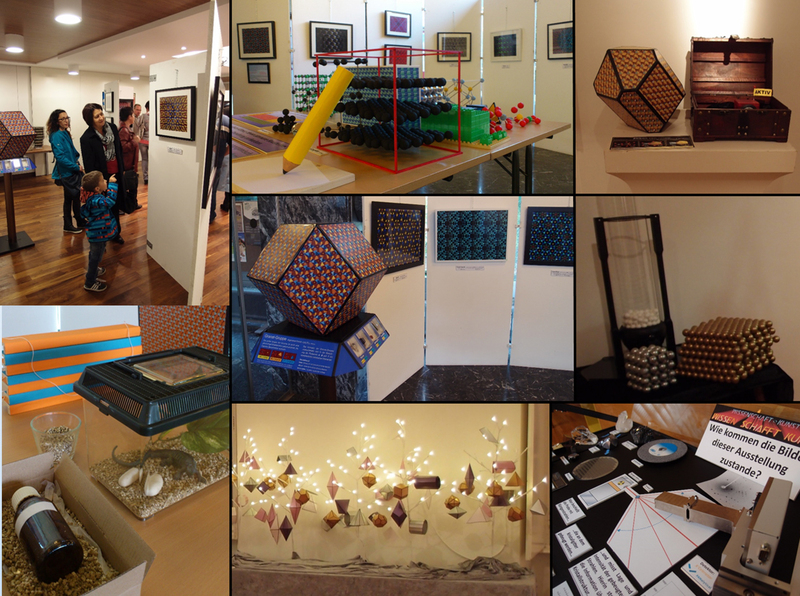 Fig.1: Some impressions of the exhibition with examples of graphics, models, experiments and demonstration. Click on the images to see larger versions. Some tour stations were located right at the national borders of Austria (Arnfels: Slovenia; Schattendorf: Hungary; Kittsee: Slovakia; Bregenz: Germany). There was a good number of visitors from abroad who were served with multilingual tours. The message of IYCr was therefore also carried to other nations, especially in the often neglected border regions. The interest among the population was very high and the touring exhibition very well visited. The coverage in radio, print and online media was very satisfactory. Most prominent events were reported to IYCr headquarters with positive feedback. As indicators of the impact cf. 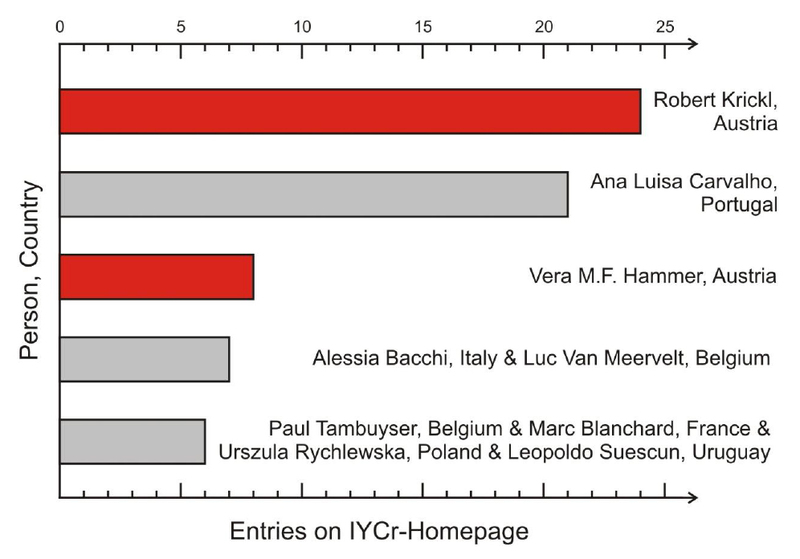 some evaluation of the reports on the official website of IYCr in Fig.2 and 3. 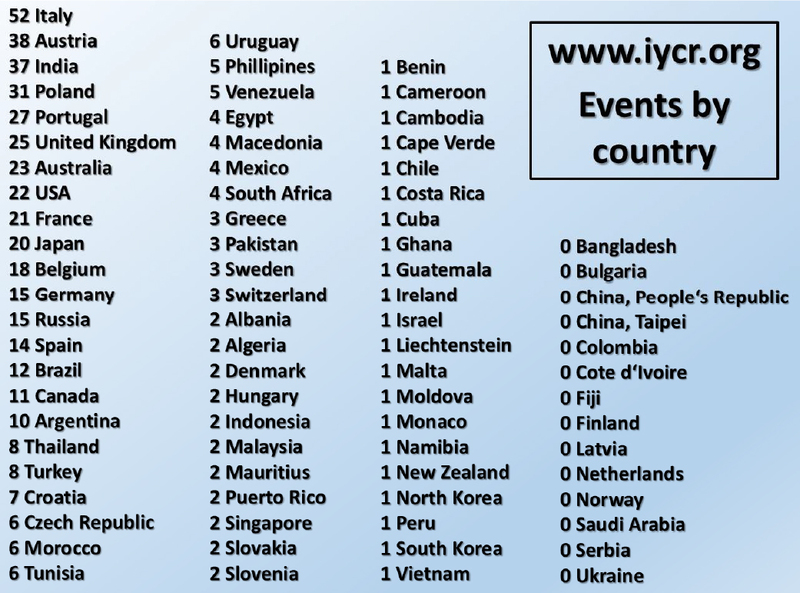 Fig.2: Number of activities on the occasion of IYCr entered in the „events by country“ section of IYCr-homepage (counted in January 2015). Click on the image to see a larger version. Fig.3: Entries of national activities on the occasion of IYCr (cf. Fig.2) broken down to responsible persons (only first five ranks shown; Austrians marked with red colour). Click on the image to see a larger version. In addition to the touring exhibition, the author conducted numerous other activities in Austria to bring crystallography closer to the public. 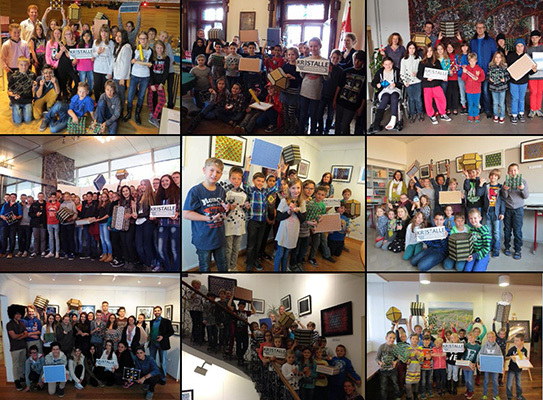 These include school and kindergarden projects, public talks, philatelic contribution, other exhibitions and outreach activities. These will be briefly outlined in separate reports. 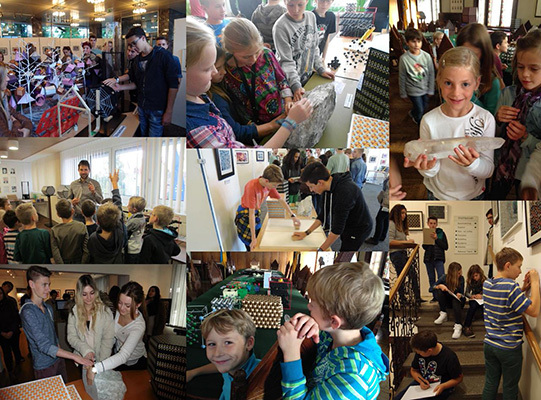 Finally, there are still some ongoing major outreach activities, such as the construction of the largest crystal structure model of the world (registered with Guinness Book of Records). It will be used for science communication in public space in November 2015 to honour the 100th anniversary of the Braggs’ Nobel Prize (http://worldrecord.r-krickl.com/en/).